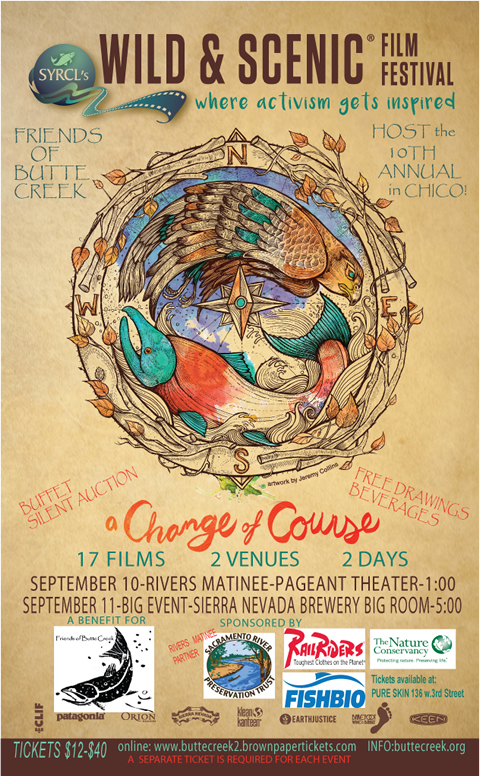 That's the theme of the 10th Annual Wild and Scenic Film Festival coming up at the Pageant Theater and the Sierra Nevada Brewery Big Room on September 10th and 11th respectively. The Saturday afternoon matinee features rivers, fish, and will demonstrate the power of river restoration to improve our ecosystems. The evening progra at Sierra Nevada's Big Room will feature 2.5 hours of inspiring environmental films. 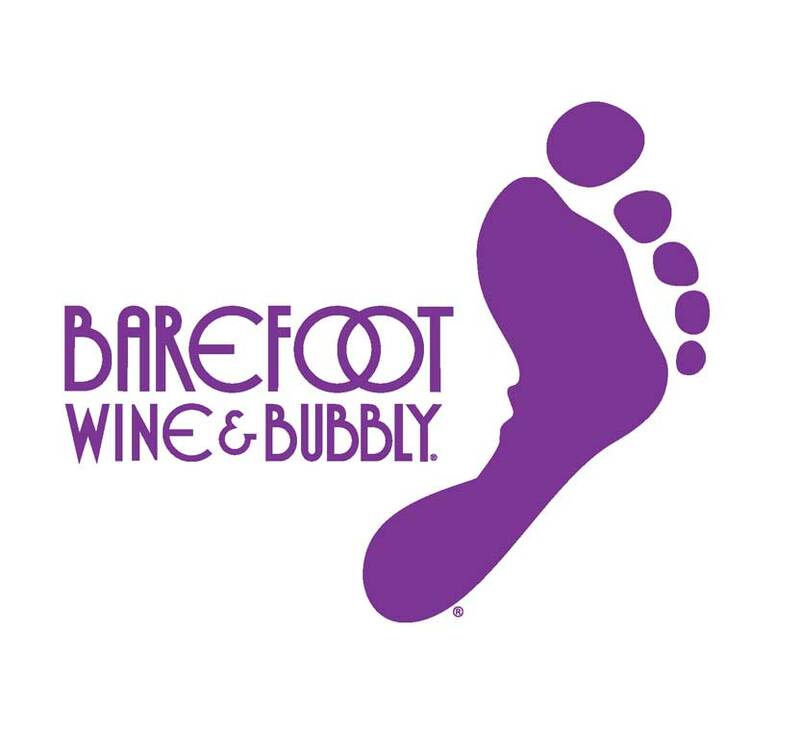 Sierra Nevada will prepare a delicious Brew Pub appetizer buffet which is included in the ticket prices and a wonderful selection of silent auctions items and free drawings will be offered. The Wild and Scenic Film Festival is a benefit for the Friends of Butte Creek. Films this year are focused on a Change of Course to our enviromental compass. 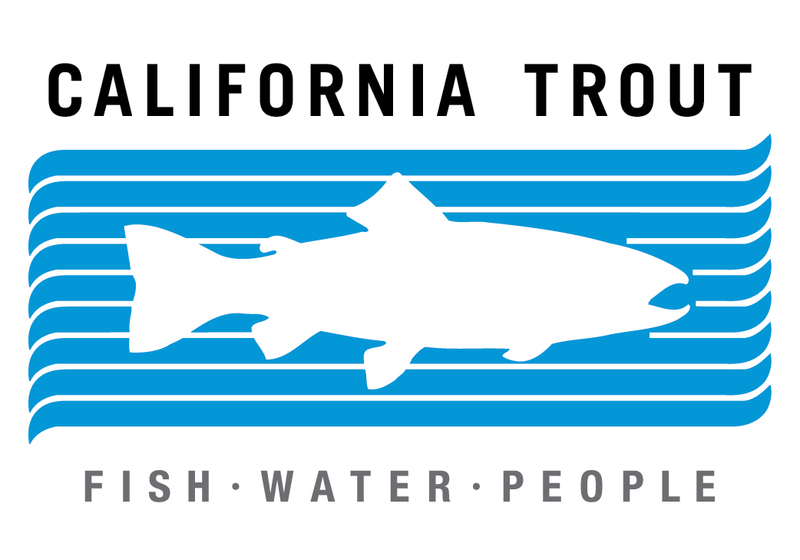 Friends of Butte Creek works to raise awareness and to provide protection for the future of the Last Best Run of Spring Run Salmon in California. A Line Across The Sky Josh Lowell, Peter Mortimer, Nick Rosen, Zachary Barr | 40 min. The Fitz Roy Traverse is one of the most sought after achievements in modern alpinism: a gnarly journey across seven jagged summits and 13,000 vertical feet of climbing. Who knew it could be so much fun? Join Tommy Caldwell and Alex Honnold on the inspiring — and at time hilarious — quest. An Education, A Father-Daughter Trip of Discovery Mike Libecki, Mike Schirf, Fitz Cahall | 2014 | 9 min. Invisible Ocean: Plankton & Plastic Emily V. Driscoll | 9 min. Folow artist Mara Haseltine as she create a sculpture to reveal a microscopic threat beneath the surface of the ocean. During a Tara Oceans expedition to study the health of the oceans, Haseltine finds an unsettling presence in samples of plankton she collected. The discovery inspires her to create a sculpture that shows that the microscopic ocean world affects all life on Earth. Mile for Mile James Q Martin | 2015 | 15 min. Ultrarunners Krissy Moehl, Jeff Browning and Luke Nelson run 106 miles through the newly opened Patagonia National Park to experience the efforts to re-wild and protect this vast landscape. Jeremy Monroe, David Herasimtschuk | 2015 | 9 min. A poetic look at a forgotten native of Appalachia, the Southern Appalachian Brook Trout. 36 Inches James Parker, Matt Diamond, Elan Levy | 7 min. A recovering apathetic millennial embarks on a journey of discovery to understand the proposed Jordan Cove Energy Project, a $7.6 billion natural gas export project through Southern Oregon. A Dam Problem Upper Deschutes Watershed Council, Wahoo Films | 2015 | 6 min. Darren Campbell, Michael Dotson, KS Wild | 8 min. An open-pit mining boom is underway in northwest British Columbia, Canada. The massive size and location of the mines–at the headwaters of major salmon rivers that flow across the border into Alaska–has Alaskans concerned over pollution risks posed to their multi-billion dollar fishing and tourism industries. California Trout, Keith Brauneis Productions, Craig Ballenger 2015 15 min. The Smith River is a poster-child for how an entire watershed can be protected. Here there are no dams, no wretched clear-cut blocks, no mitigating hatcheries. Instead, ancient forest, including iconic redwood, cloaks canyon walls. But this pristine watershed is threatened by the Red Flat Nickel Corporation that applied to drill and test 59 locations over 4,000 acres on the pristine North Fork of the Smith River. This would pave the way for one of the largest nickel mines in the West. Pete McBride, Kevin Fedarko, American Rivers | 3 min. Honoring the legacy of Martin Litton, this film follows the newest boat in the Grand Canyon Dories fleet, the Marble Canyon, on its maiden voyage down the legendary Colorado River through the through the grandest canyon on Earth. Martin pioneered whitewater dories on the Colorado River in the 1960’s and started a proud tradition of naming the boats after wild places that had been lost or compromised by the hand of man. Nature Rx Justin Bogardus, Jed Lazar, Joe Victorine, ©Dream Tree Film & Productions | 1 min. Nature Rx offers a hearty dose of laughs and the outdoors – two timeless prescriptions for whatever ails you. Paddle for the North Simon Lucas, Scott Sinton, Alex Behse, Alex Reed, Wild Lens Productions | 33 min. Deep in the Canadian North, six young men embarked on an epic adventure – 1500km, six rivers, three canoes, two months. It was going to be a mighty test of endurance, determination and friendship. But what they didn’t expect was the impact of the stories from one First Nations family. This chance encounter showed the team, that the Peel Watershed debate is not just about protecting the environment, but also a way of life. A boys-own adventure turns into a mission to show the world why some places are worth preserving. Oregon Natural Desert Association, Wahoo Films | 2015 | 7 min. The Unknown Sea: A Voyage on the Salish Kevin Campion, Shawnecee Schneider | 32 min. Captain Campion shares his adventurous journey on the Salish Sea with a crew of teen researchers whom are poised to be the next generation of marine scientists and policy makers. The film is a fresh new look at a place with one foot still firmly rooted in tradition, and the other embracing future economic development. Captain Campion and his crew discuss the environmental threats that affect the health and sustainability of this finely balanced ecosystem. To Slow Down and Breathe Grant Thompson | 2014 | 3 min. The beauty of slacklining is that is can be as introspective as it is explorative. When we’re not moving to run away from our selves, going out in to the wild places of this world can be a movement into our own souls.